The Congress party in Haryana is at war with itself. 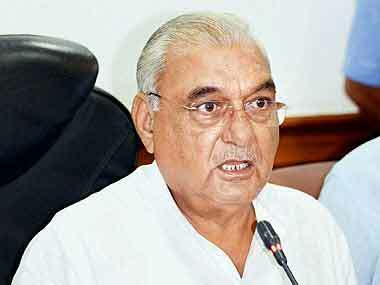 Such is the trust deficit in the state leadership that the party’s state leaders like former chief minister Bhupinder Singh Hooda, Kumari Selja, state unit chief Ashok Tanwar, Kuldeep Bishnoi and others do not see eye to eye. On Friday, they forced Ghulam Nabi Azad, who is in charge of the party’s Haryana affairs, to withdraw a list of 15-member coordination committee for the Lok Sabha polls. Azad said he was planning to replicate an experiment he successfully conducted in Andhra Pradesh and Karnataka when infighting had plagued the party units in these states in the early 2000s. Azad said that in Karnataka in 1999-2000 and undivided Andhra Pradesh in 2003-04, he hired a bus and put all the Congress leaders in it to travel across the states. “They would eat at the same place, address public meetings from the same stage and spend time with each other during travel, which built trust. I need to do something similar in Haryana,” Azad said. The Dravida Munnetra Kazhagam (DMK), the main rival of the ruling All India Anna Dravida Munnetra Kazhagam (AIADMK) in Tamil Nadu, has released the list of its candidates for the Lok Sabha election. Of the 20 names, seven are party veterans and 13 are new faces, including daughters, sons and relatives of DMK leaders. The first family of the DMK was represented by Kanimozhi, daughter of the late M Karunanidhi and sister of DMK President M K Stalin (pictured), and Dayanidhi Maran, a cousin of Stalin. The list also included names like T M Kathir Anandh (for the Vellore seat), son of DMK Treasurer Duraimurugan; former state electricity minister Arcot N Veerasami’s son, Kalanidhi Veerasami (Chennai North); and Dhanush M Kumar, son of former AIADMK MLA Dhanuskodi, who joined the DMK (Tenkasi reserved). DMK leader Ko. Si. Mani's very close aide S Ramalingam will contest from Mayiladuthurai. P Velusami, who contests the Dindigul seat, comes from a family deemed close to the DMK. Cash and jewellery worth Rs 5 lakh were stolen from former Gujarat chief minister Shankersinh Vaghela’s house near Ahmedabad, allegedly by a domestic help couple from Nepal, the police said on Monday. The theft at the residence of Vaghela, a former Congress leader who is now in the Nationalist Congress Party, took place in October last year, but a police complaint was lodged only Sunday by Vaghela’s employee Suryasinh Chavda, they said. According to Chavda’s complaint, the suspicion fell on the husband-wife duo after they did not return from Nepal as promised, the police said. As the media reported the news, the Twitter hashtag “chowkidar chor hai”, an apparent dig at the Bharatiya Janata Party’s Main Bhi Chowkidar campaign, also started trending.